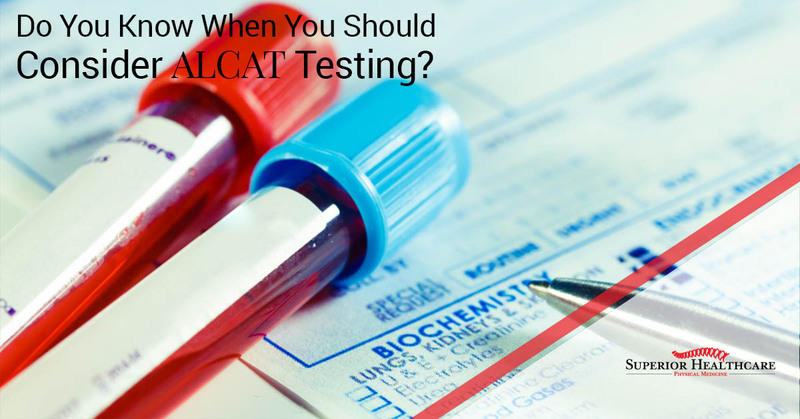 Do You Know When You Should Consider ALCAT Testing? The ALCAT test is used by holistic health practitioners and traditional MDs alike. Here at Superior Healthcare, our patients benefit from the diagnostic insight the test provides. ALCAT testing identifies causes of inflammation, gastrointestinal, and metabolic issues, helping to ensure that our treatment program is as comprehensive and effective as possible. It enables our practitioners to develop treatment programs and wellness regimens that are 100 percent personalized and tailored to each patient’s unique needs. The more we learn, the clearer it is becoming that inflammation impacts virtually every area of our health. Because the ALCAT test is so effective at identifying dietary and environmental sources of inflammation, we consider it a must-have for almost everyone. The ALCAT test is a blood test that measures your cellular reaction to more than 450 possible causes of illness, including but not limited to various types of food, herbs, and chemical substances. When cellular reactions are triggered, antibodies are released, resulting in symptoms. Unlike some other tests, ALCAT test results are easy for medical professionals to read, interpret and explain to patients. They are unambiguous. It is not a food allergy test. It tests for intolerances to multiple dietary and environmental inputs. What Substances Are Tested For? Your ALCAT test can be customized based on your particular symptoms and history. This is a partial list of what items we might be looking at to see if you have any adverse reactions. Antibiotics and Other Agents—Acetaminophen, Amoxicillin, Tetracycline, Diflunisal, and about 12 others. Who Should Consider ALCAT Testing? Anyone suffering from illnesses related to inflammation may benefit from ALCAT testing. This list is not comprehensive. If you think your illness may be related to food allergies or other causes of inflammation, come in and see us for ALCAT testing. Whatever symptoms you are suffering from, our team here at Superior Healthcare is here to help. Our team-based, holistic approach to your health guarantees that we’ll leave no stone unturned to make sure your diagnosis, treatment, and ongoing wellness plan are all tailored for your needs and represent the best possible chance for symptom relief or complete cure. Come in and see us at our Metairie, LA office today.